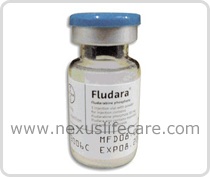 Uses:- Fludara Injection is used to treat leukaemia and other cancers. Fludara Injection works by slowing or stopping the growth of cancer cells. Side Effects:-Nausea, vomiting, diarrhoea, headache, muscle aches, tiredness, loss of appetite and pain/redness at the injection site may occur.